Clinique Take the Day Off cleansing oil is a staple of my routine, and frankly, I’m really embarrassed that it’s taken me till now to review this product! I have sensitive skin, and this, coupled with a rather, um … magpie-like … approach to collecting skincare can cause occasional problems. However, Clinique Take the Day Off oil has never, ever caused me a problem. Unencumbered by essential or mineral oils, or even, weirdly, any oils at all (the short ingredients list is full of oil-like ingredients, but of actual oil in the formulation; there is none), TTDO is a silky-feeling cleanser that removes every single scrap of makeup and sunscreen without ever stripping, or irritating the skin. And it is deliciously inert, unfragranced, and just a great choice for sensitive skins because of it. Whilst I don’t use it every day, where it becomes invaluable in my collection is when I’m introducing new products into my routine. As I have sensitive skin (I think I might have mentioned it once or twice over the years), introducing a new product into an established routine can be traumatic, so I have a couple of products that I fall back onto, ones that I know never irritate. And I use those religiously alongside any new product to ensure that any results (good or bad) come directly from the product I’ve changed, rather than the routine itself. I also have an SOS skincare routine for those times when my skin is just being irritable, and TTDO oil has made it into both those routines. Other products that I rely on for testing purposes include La Roche Posay Serozinc, and Murad Hydro-Dynamic Moisturiser, and the SOS routine is different again. For a product to make both lists is very, very rare. 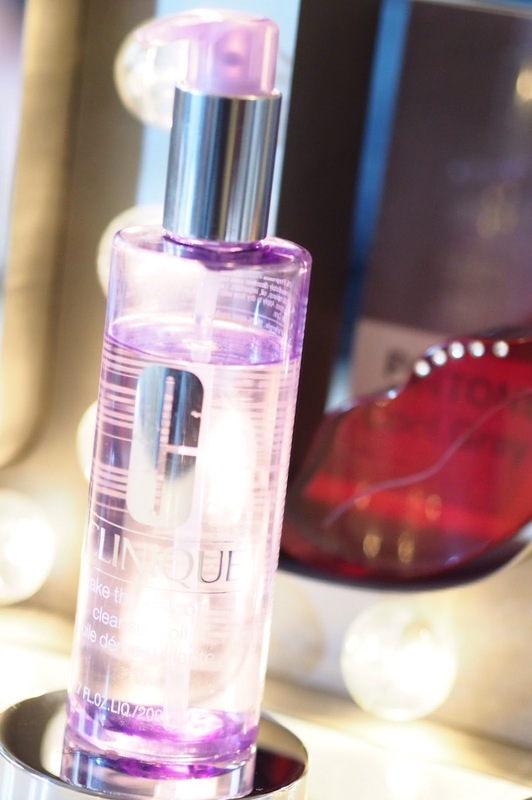 Clinique Take the Day Off oil is both gentle on the skin, and a powerful cleanser. It takes off almost all makeup just in one cleanse, and emulsifies beautifully. Also, it lasts almost forever, I’ve had a bottle on the go ever since the launch, and only recently had to buy a backup. I can’t imagine life without it. At around £19-£22 for a big 200ml bottle, it’s a bit of a bargain too.